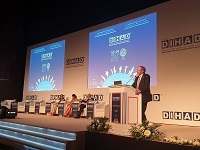 The Parliamentary Assembly of the Mediterranean actively contributed to the 16th edition of the Dubai International Humanitarian Aid & Development Conference– DIHAD – 2019, held on 12 – 14 March in the United Arab Emirates. The event was organized under the patronage of H.H. Sheikh Mohammed Bin Rashid Al Maktoum, Vice-President and Prime-Minister of the UAE, and Ruler of the Emirate of Dubai. This year’s conference was dedicated to the theme of “People on the Move”, serving as a global forum for discussing ways to address the core issue of mass migration and asylum seekers, implementing new immigration national policies, and reinforcing national borders in the absence of an agreed international approach. The conference aimed at better identifying, inter alia, the evolving causes that lead youth to migrate from their countries and to highlight initiatives that address the youth’s aspirations for stability and a decent life. The debates focused on the issue of displacement: from the importance of the Global Compact on Refugees and Migration to the key role of education, as a catalyst for integration and violence prevention, also tackling the role that media plays on these issues. Of specific interest to PAM were the several sessions dedicated to Security concerns connected to mass population movements, in light of PAM’s forthcoming parliamentary meeting on the subject that will be held in Turkey next June. Amb. Peter Schatzer, PAM Permanent Observer in Vienna, provided participants with a very detailed analysis with figures and facts on migration in the MENA and Gulf regions, highlighting the impact of the financial crisis and the global economic context, further aggravated by a looming recession. PAM Secretary General Ambassador Sergio Piazzi concluded the works of the conference. In his speech, he stressed that there are, in the world, over 26 million refugees out of 70 million displaced people, and the largest share of these individuals are in the MENA region, as the consequence of the Syrian crisis. The migration issue requires all agencies, governments, civil society and private sector to closely collaborate, in the hope that “by continuing and spreading such dialogues will contribute to bringing about a better life for the millions of people who have left their homes and needed to adapt to a new environment” Amb. Piazzi said. The PAM Secretary General also took the opportunity of the DIHAD to hold a number of bilateral high-level meetings to strengthen PAM’s cooperation with parliamentary and governmental partners from the Gulf region. In particular, he also started preparations for PAM’s participation in the EXPO 2020, which will be hosted by the UAE, following the positive experience of PAM with EXPO 2015 in Italy. The themes of the 2020 event, related to sustainable development, are key to the PAM’s mandate and work plan. A specific partnership was also discussed with MSF to assist with the evacuation from Gaza to Jordan of a number of civilians requiring urgent medical treatment at hospitals in Amman or in other countries.